In order to use these camshafts in 1955-57 265ci blocks, it is necessary to machine a small groove in the rear main journal of the cam to allow oil flow to the top of the engine. High performance. Biggest cam with stock converter. Use lower gears. Mild rough idle. Comp Cams Magnum Camshafts are very aggressive and specifically designed for the street enthusiast looking for more power with that Pro Street sound. Intended for performance oriented vehicles that will see little street use. The idle characteristics of your engine will change due to the increased duration and overlap of the Magnum Cam Series. You will notice a racey idle with the 280-grind while the 292 and 305-grinds will produce a rough or ''rumbly'' idle. Stock components are generally incompatible. Changes are needed in rear end gear ratios, headers and the torque converter. Magnum Cams will affect your power accessories to a certain extent. The 280 and 292-grinds are the biggest cams that should be used with power assisted brakes, air conditioning, etc. You should remember that the bigger the engine is, the less the cam will affect the vacuum which affects your power accessories. The smaller your engine is, the more the Magnum Camshaft will affect your power accessories. Most late model vehicles have a vacuum canister. If your vehicle does not have a vacuum canister, it may be necessary to add one. Good street performance with stock converter, choppy idle. Great for high performance driving in street machines. The 270H has a rough idle in small blocks and a noticeable idle in big blocks. This is the largest cam that can be used with a stock torque converter. The 270H should not affect power accessories, but should be used with headers and 4bbl carburetor. Best for serious street machines. This cam has a definite rough idle and will sometimes affect power accessories. It can be driven extensively on the street or raced on the weekends. The 280H needs an aftermarket converter, intake manifold and headers. Designed to fill in the gap between teh 280H and 292H. For serious street machines and bracket racers. With a rough idle and lower vacuum signal, this is not an average street cam. At least a 2500-RPM converter must be used, but a 3000 is recommended. This cam is for the serious street/strip type car. An aftermarket torque converter should be used as well as headers, intake and increased compression. The 292H has a radical, rough idle. The 305H should really be considered for Pro-Street type cars where actual streetability is not a major concern. The design of this cam also makes it ideal for all bracket racing engines. Major engine modifications are needed as well as transmission and driveline improvements. The 305H works best in large cubic inch engines and has a radical idle. This is the only hydraulic cam in the series that does not have an advance made into it and will need to be degreed in. Does COMP Cams K12-211-2 fit your vehicle? K12-211-2 - Comp Cams 'Magnum' Hydraulic Flat Tappet Camshafts is rated 4.5 out of 5 by 2. Rated 5 out of 5 by GMC C3500 from Great profile, nice sound at idle, pulls great I got this kit for my 71 GMC C3500 it had a GM crate motor in it. Manual trans. I wanted more power & torque. So Comp cams cam kit with the 270' duration 470" lift gives me a "smooth" slight choppy idle 700 rpm with 18inHG 10' BTDC Paired with Edelbrock RPM Heads, AirGap intake and AVS carb 650cfm, Herman headers to 2-1/2 exhaust. I still need to tune the carb, needles and jets/ spring kit on the way from Jegs. I will swap out the manual trans for a 700R4 soon as this truck needs another gear! Maybe ring and pinion swap too. I'm very happy with the cam kit as it will work with any of the options I plan on doing later. 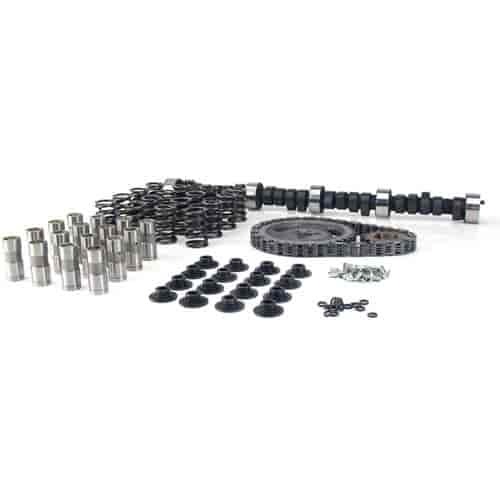 No, you should not need to machine your cylinder heads to use this cam kit. This is not compatible with the '96 GMC. Will this cam fit a 96 5.7 LT1? If not which one will? Yes, this will work with your truck as long as the engine still has the flat tappet lifters. I have a center bolt 350 the description say 55' to 98' is it safe to assume the cam will work in a one piece rear main block? Yes it will work in a 1 piece rear main seal block. Will this cam work in a 1997 lt1 camaro?